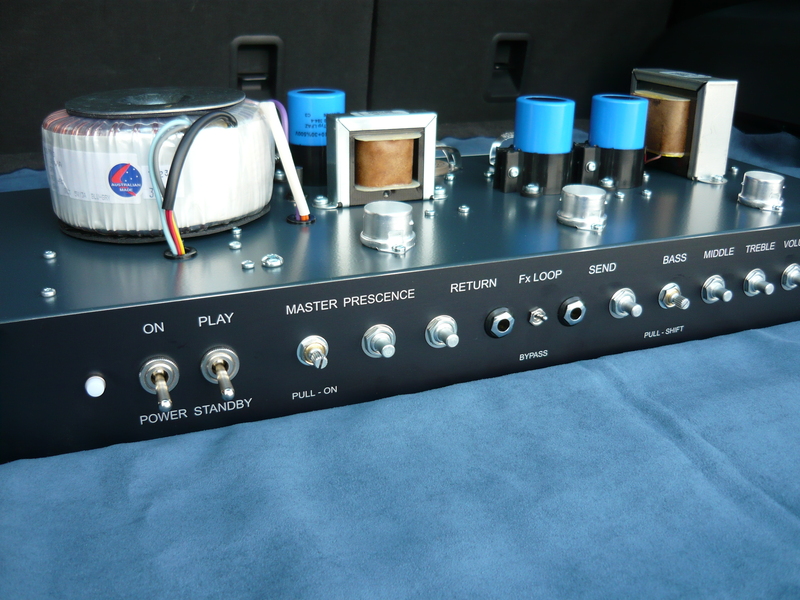 Here is another in our occasional series of blogs where we publish a visual progress report of a custom-order amp build. In this case we have two customers, Steven and Peter, who have ordered exactly identical amps and cabs, except for the choice of speaker grille material. 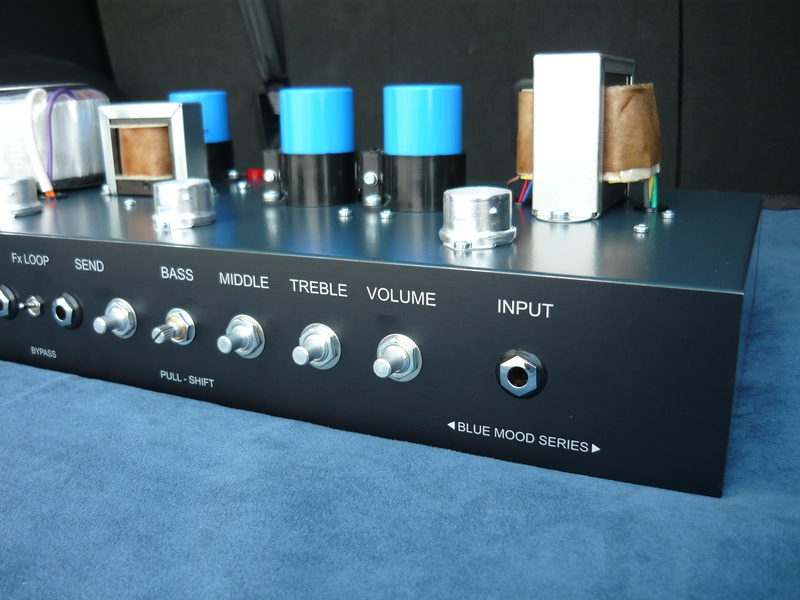 The photos show a Blue Mood series amp chassis being assembled, this time rather than 6V6 output valves and a power output of 12 to 18 watts, we are building a pair of amps of about 40 watts output, employing the 6L6GC output valves as reissued by New Sensor under their Tung Sol brand. These amps are a customised variation on the Blue Mood concept, with the addition of fully-featured valve (tube) driven FX Loop. The Loop features separate Send and Return level controls, as well as separate Send and Return buffer stages. Obviously the Return buffer stage can be configured as an additional gain stage, or purely just to balance the wet signal against the dry signal. The FX Loop can be activated or bypassed by means of a toggle switch mounted on the front control panel. There is no need to be messing around at the rear of the amp in the middle of a gig or session. This Loop switch provides true hard-wired bypass for maximum transparency. The Loop can also simply be patched back into the Return jack for use as an additional gain stage. 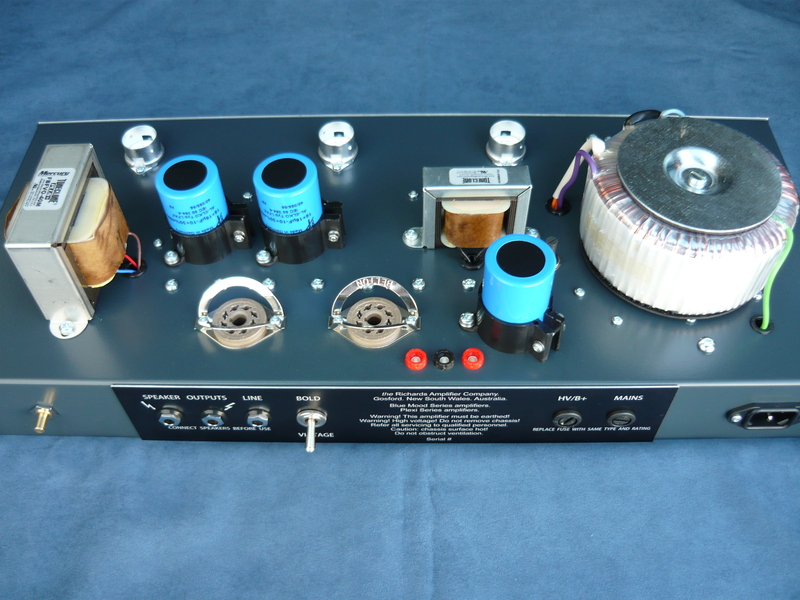 We can draw on 20+ years experience retrofitting valve-driven FX Loops to JCM800’s and 4×10 Bassman reissues, for example, when designing a custom amp as shown here. This might be a good opportunity to outline our philosophy on FX Loops in guitar amplifiers. We choose to implement a valve (tube) driven Loop over the alternatives every time ! The primary issue when designing a Loop, apart from achieving the desired levels of transparency and headroom, is obtaining broadly the same tone from the amp, regardless of whether the Loop is in use or not. This is what most players would expect – most players don’t want a different sounding amp when the Loop is in use, from when the Loop is not in use – they don’t want some radically different tone. Our philosophy is that the design of the FX Loop, and therefore its tone or sound, really should be an extension of the design and sound of the preamp itself, and not a departure from it. 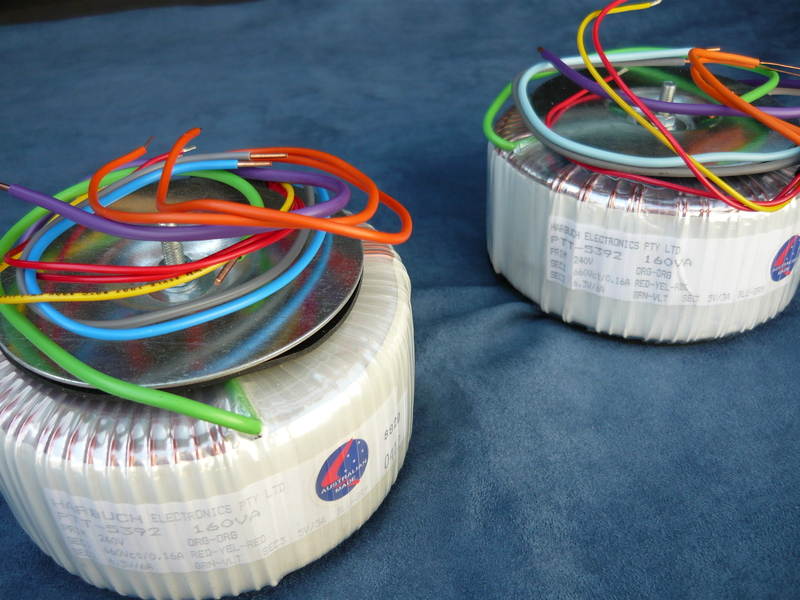 You can see from the photos that we have installed toroidal power transformers by the great Harbuch company of Sydney, for less weight and less radiated noise, plus ToneClone filter chokes and 40W audio output transformers from Mercury Magnetics, arguably the world’s best known supplier of specialist guitar amp transformers. 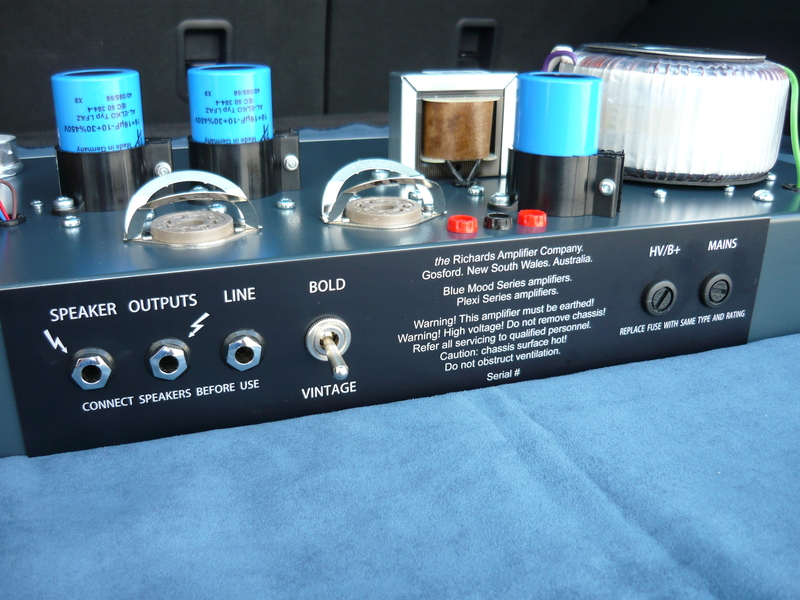 Our final photos show the matching 1×12 Tone Cabinets as supplied with these two amps. As we said at the beginning, both customers ordered cabs covered in blonde tolex, but whereas Peter favoured the oxblood grille material, Steven favoured the wheat grille. Both customers requested alnico-magnet 12-inch speakers by Weber, and these are actually the perfect speaker for these amps. Well, in closing we should probably remind you that we are in fact from March 2012 an authorised Mercury Magnetics Service Centre, meaning we are factory authorised to supply and install all Mercury Magnetics products in your amp. We are also happy to install MM transformers as supplied by you. This entry was posted on December 9, 2012 at 8:28 am and is filed under Amps. You can follow any responses to this entry through the RSS 2.0 feed. You can leave a response, or trackback from your own site.